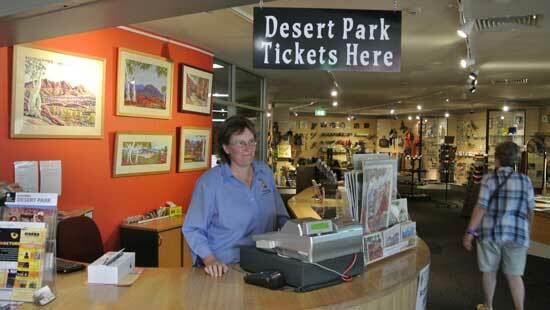 It’s an opportunity that will surely be the envy of many: the Ngurratjuta art centre has bought the gift shop at the Alice Springs Desert Park. It will be used to exhibit and promote the work of its artists, and provide an income to their enterprise from its trade in the full line of gifts and souvenirs. The Desert Park is also keen to have the artists painting on site and this looks set to happen from late March next year, as the cooler weather arrives. 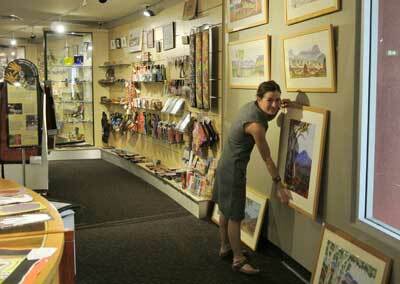 Above right: Coordinator Iris Bendor installing the watercolour display at the shop. 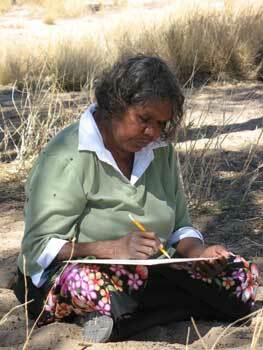 Ngurratjuta artists are best known for their watercolour landscapes in the Hermannsburg tradition, though they also include some ‘dot’ painters. The Desert Park is an ideal outlet, attracting as it does people with an strong interest in the landscape and particularly the West MacDonnells, the artists’ stamping ground. With the art market at an ebb, the gift shop is a way to reacher a broader range of potential buyers, with both high end and emerging art on display, says coordinator Iris Bendor. Having the artists on site in the park – in an open-air shelter with kitchen and bathroom facilities – will also increase their exposure, she says. In the two weeks since Ngurratjuta took over the shop, two of the artists, Mervyn Rubuntja and Peter Taylor, have visited, says Ms Bendor. They expressed their willingness to get involved beyond painting, by interacting with visitors. Apart from the possibility of casual conversation between artists and visitors, there is talk of having events in collaboration with the park, such as special exhibitions and seminars. At left: Artist Lenie Namatjira in a ‘painting on country’ workshop. Her work was recently acquired by the Art Gallery of NSW. Photo courtesy Ngurratjuta Iltja Ntjarra Art & Gifts. Project-based painting is another possibility for stimulating the artists’ own practice. An example would be a project focussed on Mount Gillen (Akngwelye / Gnoilya), which dominates the view to the west of the park and is, of course, sacred to the Arrernte. Another could be artists’ reinterpretation of landscapes made famous by their forebear, Albert Namatjira. Not so long ago the future was not looking bright for the Ngurratjuta artists, and for some months they have been without a studio. Now “we’ve gone from no opportunity to a huge opportunity”, says Ms Bendor. The national interest in the watercolour movement remains strong. For instance, the Art Gallery of New South Wales has just acquired four works by Ngurratjuta artists – two by Ivy Pareroultja, one by Gloria Pannka, and one by Lenie Namatjira – to complement their already substantial collection. And a new book, a biographical study by Martin Edmond of Rex Battarbee and Albert Namatjira, will be published in early next year. Hopefully the business and other opportunities arising from the move to the Desert Park will provide a strong context for the movement’s living exponents to continue their work. Below: The art enterprise will benefit from the full commercial opportunities of the shop – its ticket and general souvenir sales as well as art sales. Robyn Williams at the counter. Went out today and the gift shop looks really good. The art works are beautifully presented and displayed. I like the idea that the subject matter of the majority of paintings, in the Namatjira landscape style, is just there, just out the door. And how wonderful for artists to be actually there painting, in a sympathetic public space. This has been sadly lacking in Alice Springs. Our publicly funded art gallery has consistently failed our Indigenous artists and tourists who come to see a bit more than just a finished canvas. Congratulations to Iris and her team. What a wonderful venture this will be for all of the artists to display their works and to be involved in some way with the public. I wish all involved great success in this new endeavour and hope to come and see you there sometime next year. God is great and greatly to be praised. We thank Him for answered prayers for this particular group of artists, whom He has blessed abundantly. Praise His Holy Name!